<!-Eric Gill. 1882-1940--> Eric Gill. Design for paper: 'Fieldwick's Superfine Shag. Ditchling'. 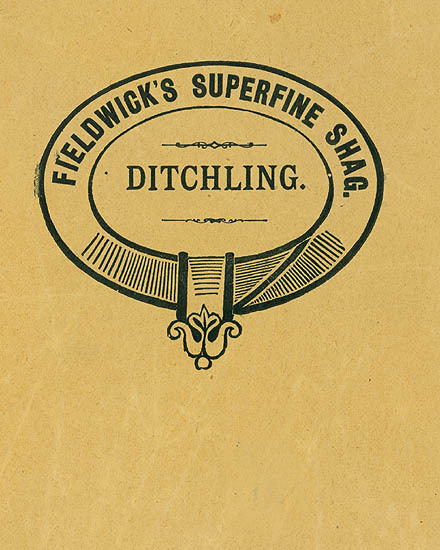 Design for paper: 'Fieldwick's Superfine Shag. Ditchling'. Ink on brown wove paper. 2 7/8 x 3 1/8 (sheet 4 5/16 x 5 11/16). Mounted on backing sheet that is annotated verso, 'By Eric Gill from Leonard Baskin Collection given owner to L.B. on 10/12/73' in ink. Unsigned. $1,250.